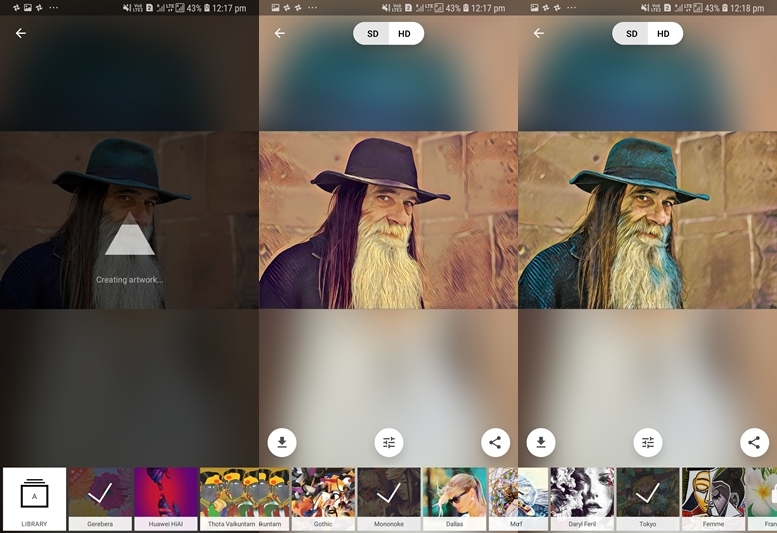 The Google Playstore is home to thousands of photo editing apps. Most of which offer nothing except a few filters, but, there are a few apps that would help you take your editing-game to the next level. All you need is your Android smartphone and a few minutes to download these apps and begin your fun editing process. We understand that editing on smartphones should not be time-consuming and also be easy to use without having any professional editing knowledge so we have picked the best apps for any kind of editing style you would prefer. Let’s take a look at the best photo editing apps available on the Playstore. VSCO is one of the best image editing applications available on the Playstore. It has the most straightforward user experience and high quality presets which are not like the typical preset filters you would find on other basic editing applications. The application also has the option to organize your tools so you can select the ones you prefer. 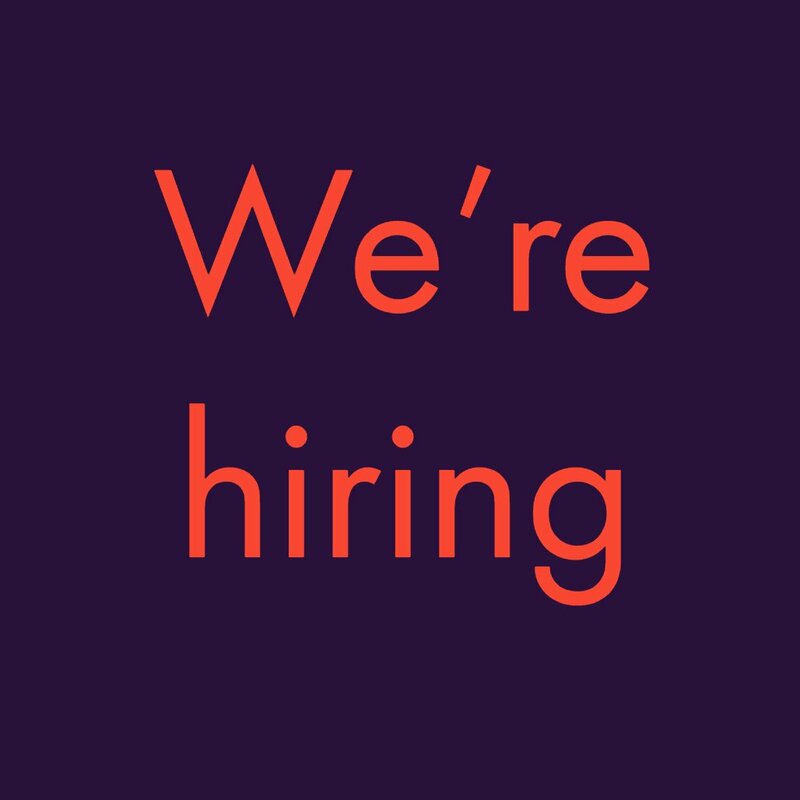 VSCO offers an easy one-tap editing experience. 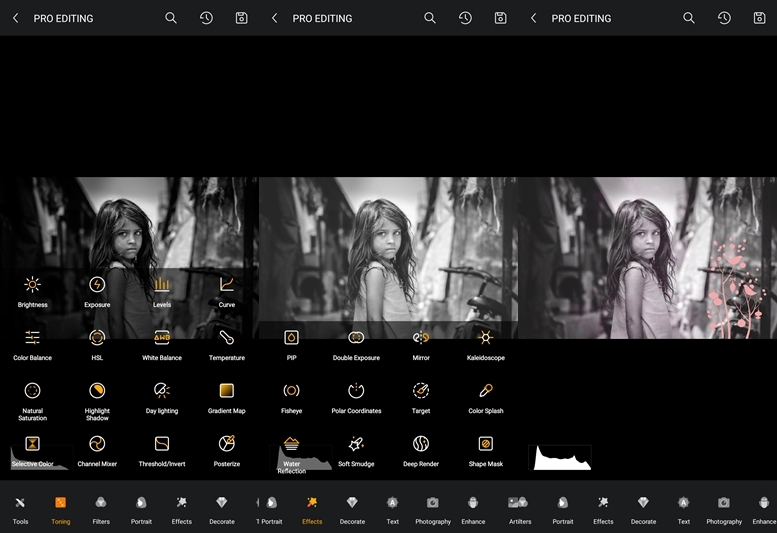 You can check out their various presets and when you find the one you’re satisfied with, simply go back to the ‘studio’ page on the app and download the image to your gallery. However, if you would like to fine-tune the image further VSCO has several tools to adjust the brightness, contrast, hue, and saturation etc. It also gives the user the ability to add colors to the highlights and the shadows. There are some presets which could be unlocked by purchasing them, however, it’s not necessary as the presets offered for free are good enough for most users. 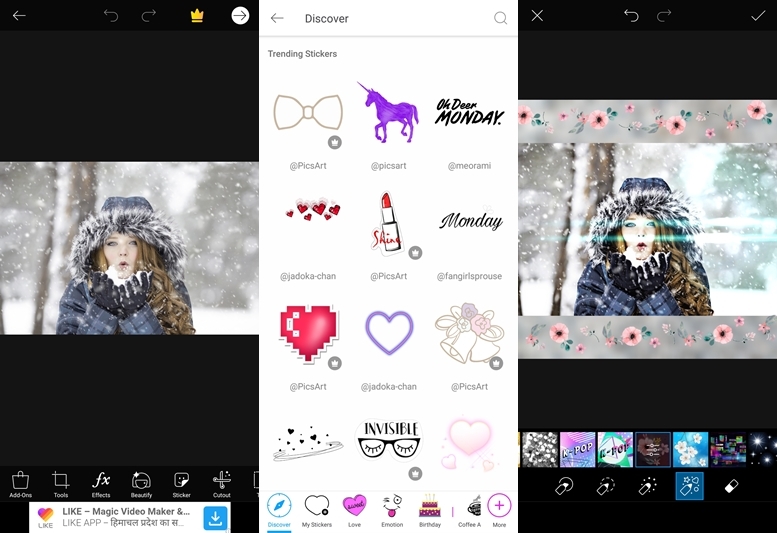 PicsArt offers a ton of features it would not be over-exaggeration if we said that PicsArt offers almost exactly everything that the PC version of Adobe Photoshop has to offer. It has basic features which are easy to use and a fully fledged professional editing mode built-in. 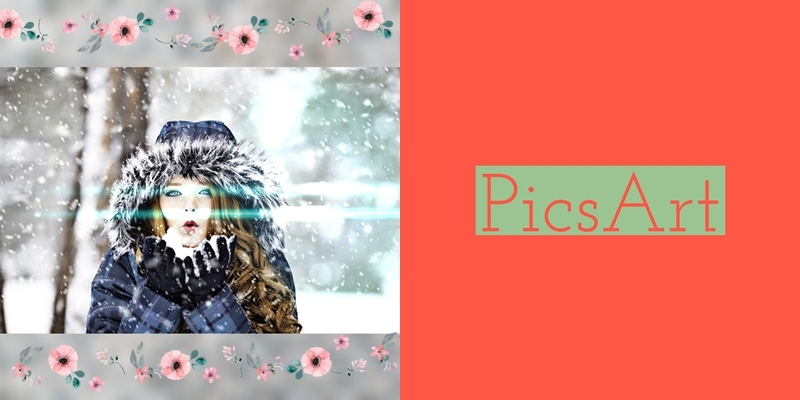 PicsArt offers the ability to add stickers and effects to enhance your images, PicsArt also offers a variety of image styles to change to look of any picture. It also offers a beauty mode to correct any skin imperfections and to brighten and whiten the face in case of a portrait. You can also add a mask to your images while editing specific parts of an image to create stunning effects. Several other features are also there such as Double Exposure, Lens Flare, Shape Mask, Frames, Square Fit for Instagram and Stickers. You could also use the brush tool to draw flowers or other preset designs in the app over your image. 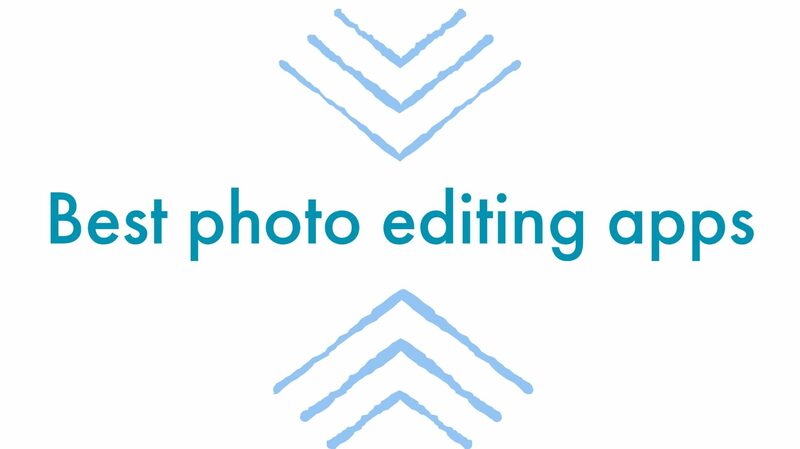 Pixlr has all the basics of a photo-editing app such as the ability to crop, rotate, adjust exposure, contrast, sharpening etc. It has several effects as well, though most of them are basic filters, the ‘creative’ effect option built-in the app is quite unique and could make your pictures unique. Pixlr lets you add text on the image with a heap of fonts to chose from. The app also has an effect option called ‘Stylize’ where you could turn your picture into a sketch, watercolor, poster, etc. It does not always produce a great result, however, it is fun to try out. Pixlr also offers several ‘Light leak’ options for users to play around with. The Pixomatic app offers something which just can’t be done easily by any other app mentioned on the list, which is background changing. Though it is possible using PicsArt, it requires a lot of effort. 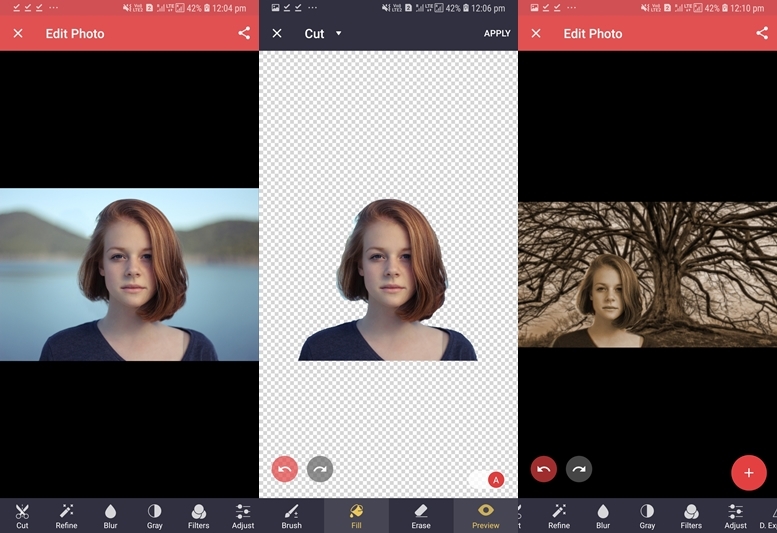 The Pixomatic app lets users swap out the background from an image in just a few easy steps. The first time you open the app you would be guided with a quick tutorial on how to use the background changing feature. Apart from offering the ability to change the background, the Pixomatic app offers almost as many features as PicsArt including the Double Exposure effect. There are several other filters which change the tone and colors of your images. Not all the effects are good but nevertheless, offer users the ability to pick and choose according to their preference. The edge detection of the app is really good and users can create stunning images using the background changing option if done correctly. If you used any social media platform app back in 2016 you would have definitely come across several people posting images edited using the Prisma app. The app blew up when it was released with millions of downloads. The reason why Prisma gained so much attention was that the app offered a style of editing that no other app on smartphones could match at the time as the effect created was unique and cool. Prisma offers a simple yet effective user experience. You get too chose from several different effects to apply to your images, each effect gives a unique look to the image. If you’d like there are more effects on the app which could be unlocked by paying a small amount. The app also offers basic adjustments such as brightness, hue, saturation, contrast etc. Snapseed was created and developed by Google. The app has several robust features for getting the best edit possible. The portrait mode on Snapseed is something everyone should try out. The portrait mode allows users to enhance the eyes, face spotlight, and skin smoothness as well. Snapseed also has several other tools such as the ‘Healing’ tool which allows users to remove any spots or correct any flaws as well as remove unwanted objects in the image. The app also has a feature no other smartphone editing app can do or at least as well, which is the ‘Head pose’ ability. Users can change the position of the person’s head in the image which is really cool to look at. We would suggest you to at least try this feature once and see for yourself how great it is. 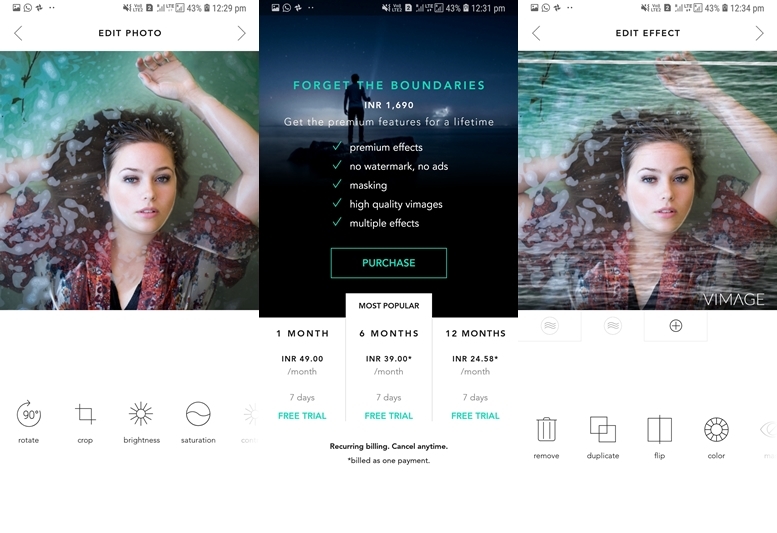 Snapseed also allows users to create Double Exposure images, however, does not handle this feature as well as PicsArt or ToolWiz. ToolWiz is another great feature packed app. The app offers all the features you could need and then some more. 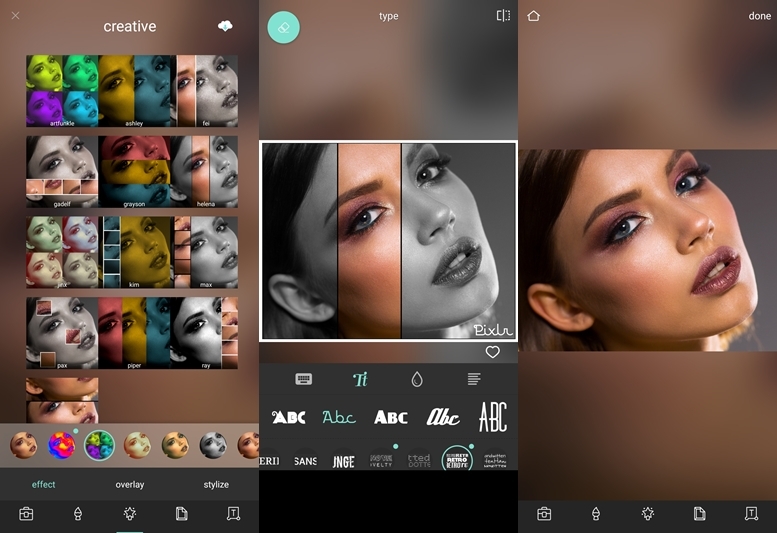 The app offers several basic editing modes as well as a feature similar to Prisma which is unoriginally named as Prismart. However, there is a Pro editing mode which is just as good as PicsArt if not better. The user experience is a tad bit complicated specifically if you are not familiar with photo editing apps but you’d be learning up all the features within no time. ToolWiz is also one of the best apps to create the Double Exposure effects. There are many filters built-in the application as well and offer a cool look to your images. 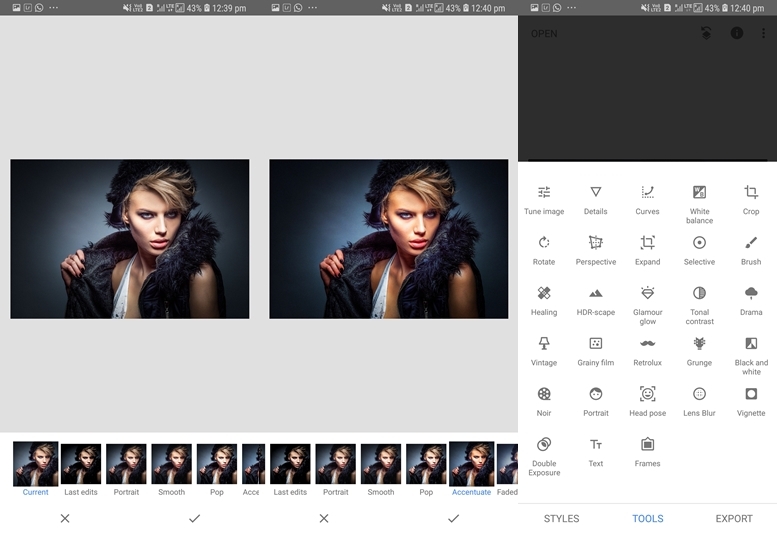 If you love editing images on Photoshop, ToolWiz could be your go-to alternative to Photoshop while you’re on your smartphone. This is one of the coolest apps we have come across. It’s a basic and fairly simple to use photo editing application. The purpose of the app is simple and straightforward. PICNIC allows users to change the sky in their images. The app offers several different sky effects to choose from. 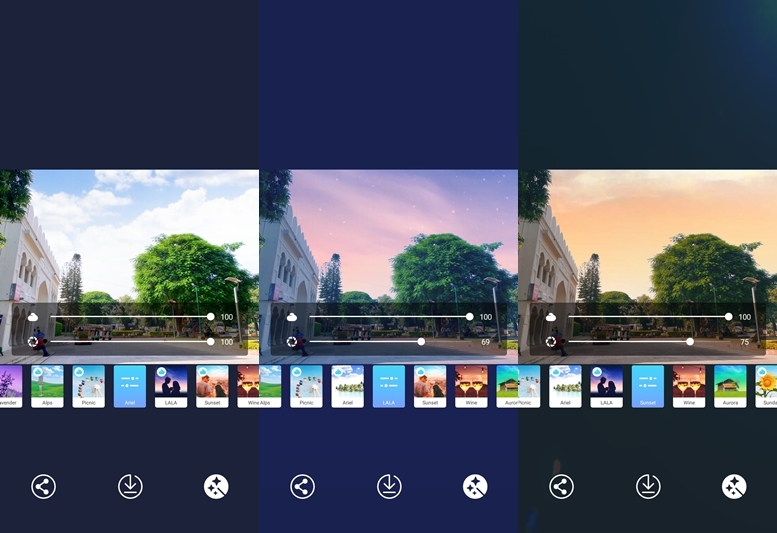 To use the app you should load an image which has the sky visible then simply tap on each effect to view the change in the sky. PICNIC also automatically adds an effect to the rest of the image to make it match the different sky effects. You’ve probably heard of Adobe Photoshop and Lightroom CC for Mac/PC. Lightroom on Android offers almost the same experience to what you would find on the Mac/PC version of the application. You can change the Hue, Saturation, Brightness, Contrast, Clarity and just about any other aspect of the image. Lightroom also offers the ability to change individual colors as well as add a split-tone to your image to enhance the overall look of the photo. There is also the ability to adjust the Highlights, Mid-tones and the Shadows using Curves. Users can also add a vignette to the image and also remove haze from an image. Lightroom also offers several presets to apply for a quick and easy edit. 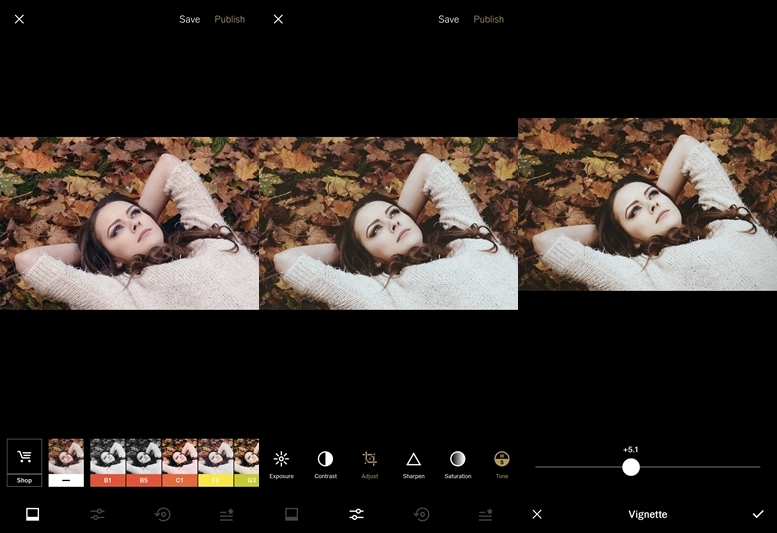 Unlike the other photo editing applications on the list, VIMAGE offers something that no other app on the list can do which is adding moving effects on-top of your image, hence the name VIMAGE(Video Image). The app allows users to overlay a video effect on an image to create really cool and unique effects. VIMAGE has several effects including rain on window, steam, fireflies, smoke, running clouds etc. You can pick the effect you would like and place it over the image. The app also does offer shape masking, however, it can only be unlocked by purchasing the app. So go ahead be creative and create beautiful Vimages. 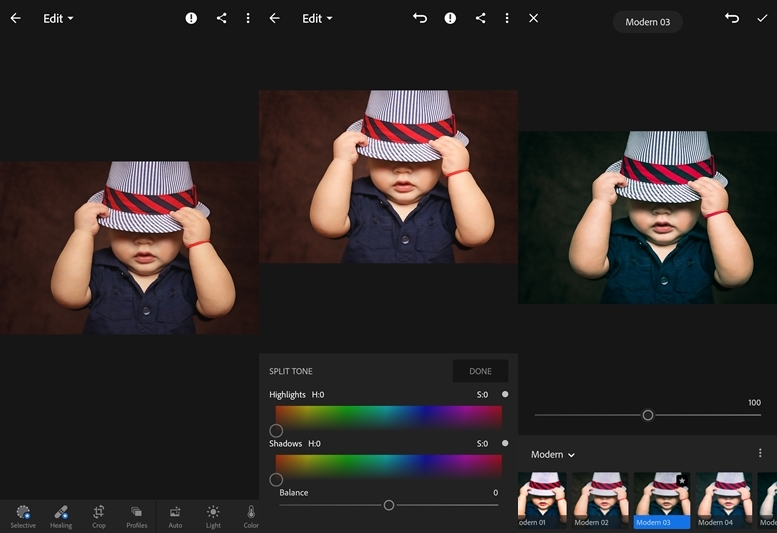 What’s your favorite photo editing application and why? Let us know in the comments below.